A small 21mm PWK bushel type dish comes with its flexible sleeve! This product is no longer for sale! 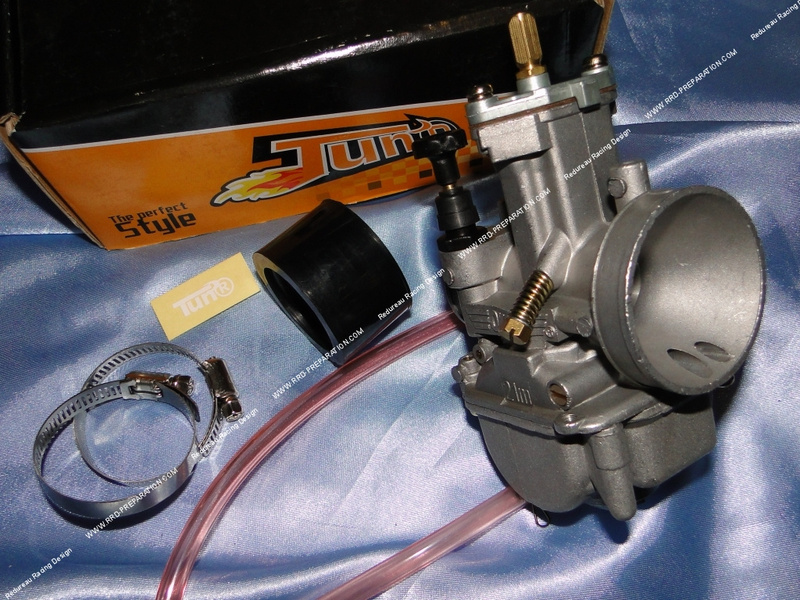 Here carburettor TUN 'R PWK 21mm This carburetor KEIHIN copies of models manufactured by OKO is almost identical to YSN. Like all copies of KEIHIN, they are manufactured in Asian countries. This carburetor is far from having the finish and quality of the true KEIHIN carburetors. Small defects finish, but not clean machining this model is not too bad and joints are good. It offers not poor performance and a price defying all competition! Air filter attachment Ø 50mm, mounting Ø 35mm pipe with machining for lip anti-slips. Once properly adjusted carburetor that is good enough and has a good recovery. Type sprinkler KEIHIN we shall put it, the POLINI, OMEGA, STAGE 6, TUN 'R or even true KEIHIN sprinklers will go very well. This is clearly a great value.